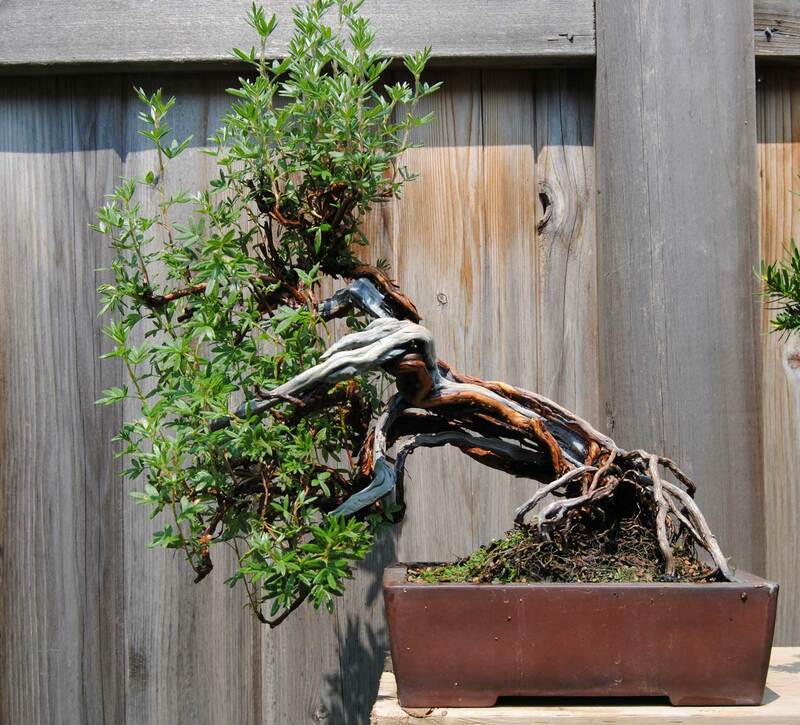 The phrase “bonsai is not a rescue mission” is sometimes used to discourage eager bonsai enthusiasts from trying to make a bonsai from every plant they find. Instead, we should focus on the best material we can possibly get our hands on, thus increasing our chances of making something we can be proud of. 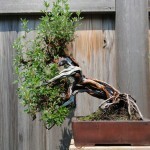 Sometimes, however, bonsai really is a rescue mission. Story time! Last August I responded to an online ad where someone was selling their collection. 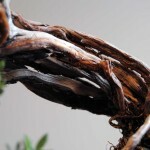 Not knowing what to expect from the vague description and two blurry pictures of some tropicals, I arrived surprised to see a very old and once impressive bonsai collection in its final death throes. 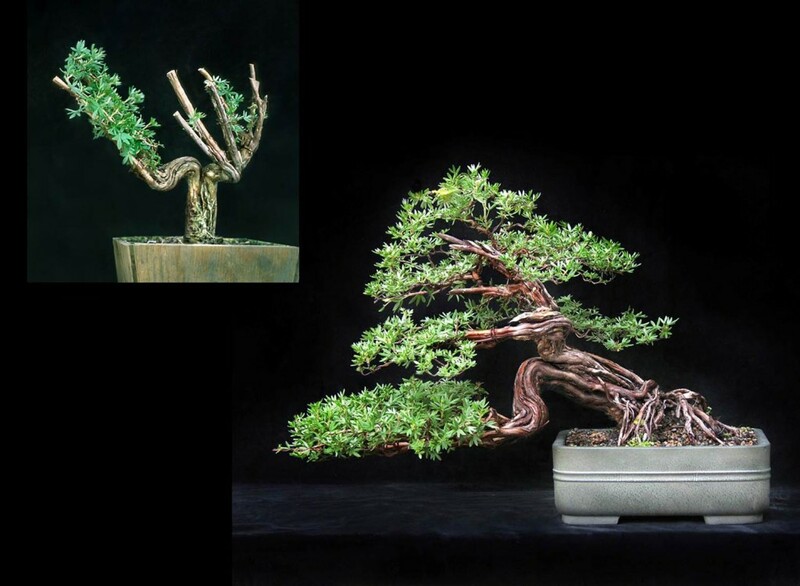 This elderly gentleman had been doing bonsai quietly in his backyard for 30-40 years, away from the clubs and shows, and now was in the predicament of having to sell everything due to failing health. He had (understandably) put off selling them for years, but in those last few years the trees suffered greatly. To make matters worse, everything was planted in pretty much pure topsoil and was weak to begin with, therefore many were unable to handle the stresses of erratic watering. Some of the tougher species were still hanging in there, but other more finicky ones like this impressive Japanese white pine had no chance. After much haggling I went home with two larches, a ginkgo, and a Japanese maple – three very tough species that had managed to survive but were now in serious need of rehabilitation. This was August 2014 and some of the trees were already showing fall colours- A sign of definite stress. I’m happy to report that all four trees survived the winter and were completely barerooted and repotted this spring. They seem to be doing well and I anticipate that they will have recovered their strength by the end of this growing season. 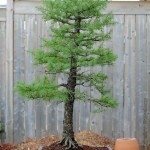 American larch, as purchased last summer. This was definitely the strongest of the trees I bought, but still was obviously weak. Budding out nicely this spring. 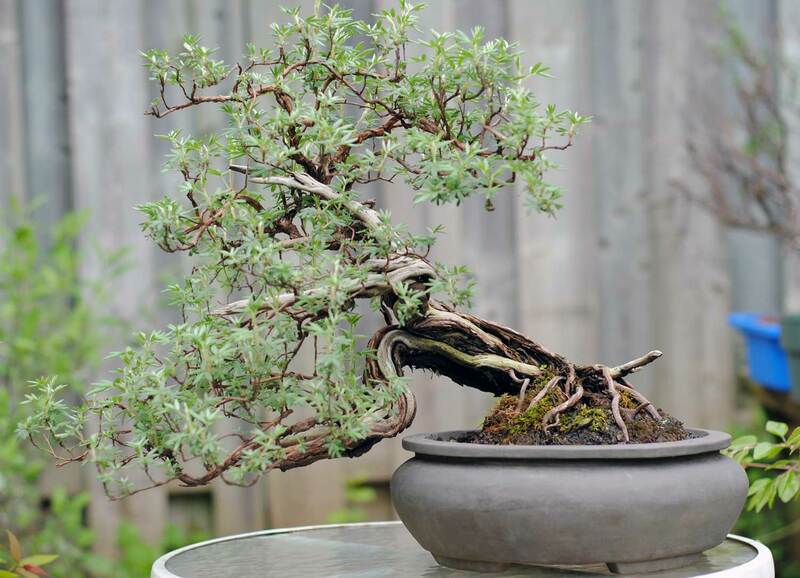 A cool tree that is begging to be planted on a stone slab. 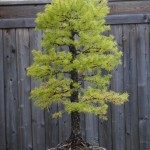 Second larch, as purchased. It is never a good sign to see fall colour in August. However, the tree had set winter buds so I though it was worth a chance. 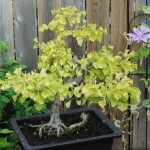 Ginkgo biloba, as purchased. Again, showing obvious signs of stress. You can clearly see the pure garden soil these trees are potted in. Budding out after transplanting. It is extremely rare to see a ginkgo with any sort of movement in the trunk. While the movement is pretty monotonous and artificial looking, this tree is cool just because it is unusual. Definitely more of a penjing feel to this one. 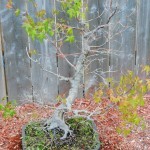 Lastly, the Japanese maple as purchased, clearly extremely weak, already having lost most of the branches. Very, very root bound. Budding out this spring. 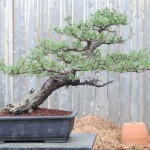 Fortunately the main trunk is throwing new buds… for a while I though it had completely died back to the first branch. It may be hard to see the value in this tree – certainly it is a long term project. But it has a nice trunkline and is not grafted. That along makes it worthy of some attention. This Potentilla is as fragile as a stained glass window and parts of it literally crumble away every time I work on it. It has undergone some pretty radical changes since I acquired it in 2011, and certainly does not look like the tree I initially envisioned it would become when I bought it. 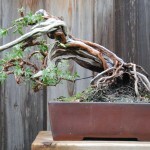 If I could give one piece of advice to anyone who wants to work with Potentilla – especially a deadwood specimen – I would say keep the trunk as clean and dry as possible. They are extremely susceptible to rot. 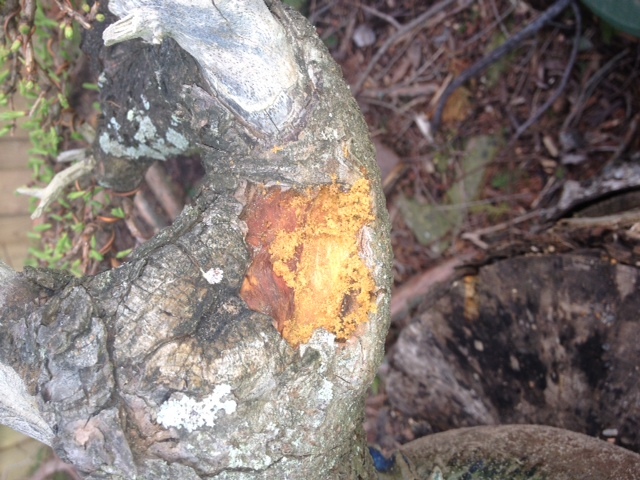 Brush it, lime sulfur it, treat it with wood hardener, remove dead bark… all that good stuff is essential. The main things I did this year were to remove the last of the rotting parts, soak every piece of deadwood in lime sulfur then wood hardener, and compact the crown. 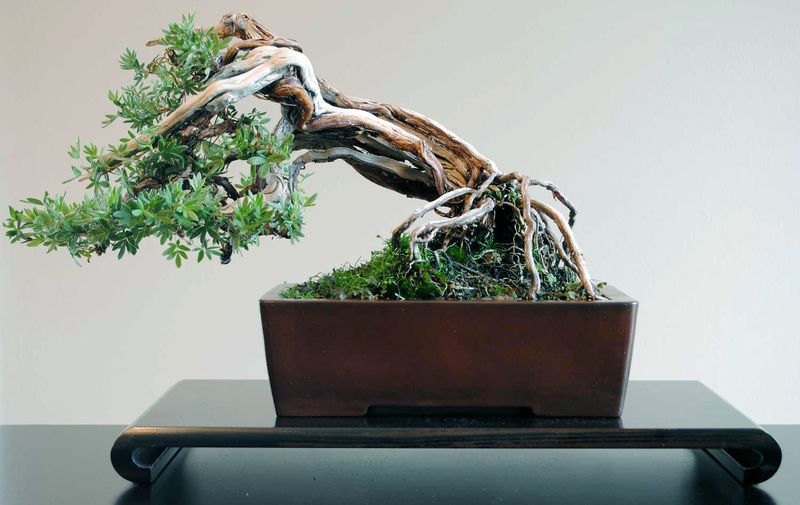 I also completely redesigned the branch structure such that it is much more simple and “bonsai like”. This is contrary to the wayward, random nature in which Potentilla grow. I’m not saying the current image is better than some of the earlier ones. Certainly some incredible deadwood features have been lost. Next step is to find the right pot, which certainly won’t be easy. I figure this tree still has a couple years of life before it returns to the dust from whence it came. The crown still needs a bit of filling out, but that won’t take long. July 2013, after initial reshaping. The current trunk is a skeleton of what it used to be. Although perhaps this is where some of the charm lies. July 2013 before reshaping, after trunk cleanup. May 2011 as I received it. This is the earliest image I have of the tree. I have no idea of the dates, but presumably the top left shows the tree soon after collection, while the other is the pinnacle of the tree’s development under its previous owner. This forest was assembled almost exactly three months ago. 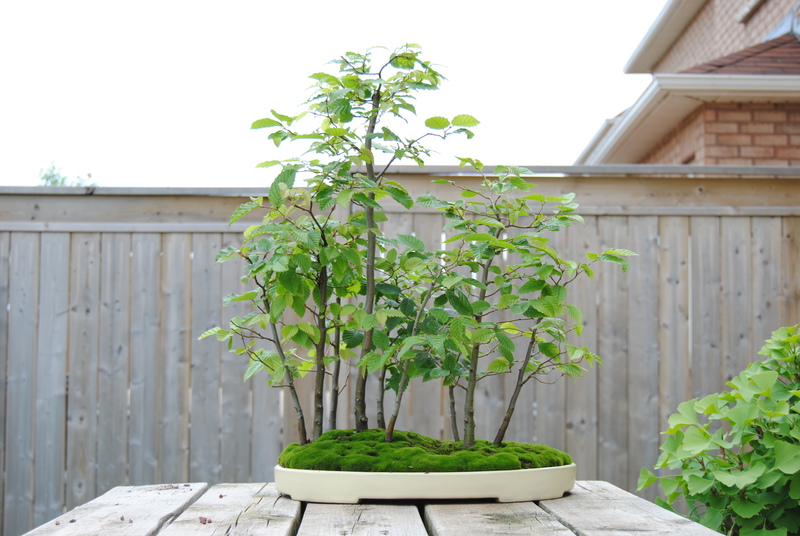 It began to flush out nicely but then developed some health issues – the leaves were damaged and discoloured, and the new growth was weak. It was definitely not a pest issue. I am pretty sure the problem was a pH imbalance brought on by the moss I covered the soil with. Well, not the moss exactly, but the grey stone dust in which the moss was growing (it was collected from a gravel lot). Who knows. I was too lazy to actually research the issue, and the tree never really seemed to be fatally ill. Whatever the problem was, it went away and the tree has been growing strongly for the last few weeks. Unfortunately the earlier problems kept me from cutting back the spring shoots, which means the tree is already behind schedule in terms of ramification development. Today I cut off all the ugly damaged leaves and cut back the growing tips. I think complete defoliation may be appropriate for this species but I am still just getting acquainted with it, so maybe next year once I have a better feeling for what it is capable of. After leaf and shoot cutting. Damn birds been in my moss. I live in a treeless cookie-cutter suburb so squirrels are not a problem. But man, there are birds everywhere. In keeping with the larch posts, I thought I would talk about what is perhaps the most infamous pest of Larix laricina – borers. Borers are insect larvae that chew on the living tissue of trees as they tunnel around inside the trunks and branches, invisible to the naked eye. The parent insect (usually beetles or moths) lay their eggs inconspicuously on the bark of the tree and, upon hatching, the little demon-spawn chews its way in. One interesting thing about borers is they are usually only a problem on weaker trees with a subdued systemic defense. Strong trees with a heavy sap flow are better able to restrain a potentially disastrous borer infestation. 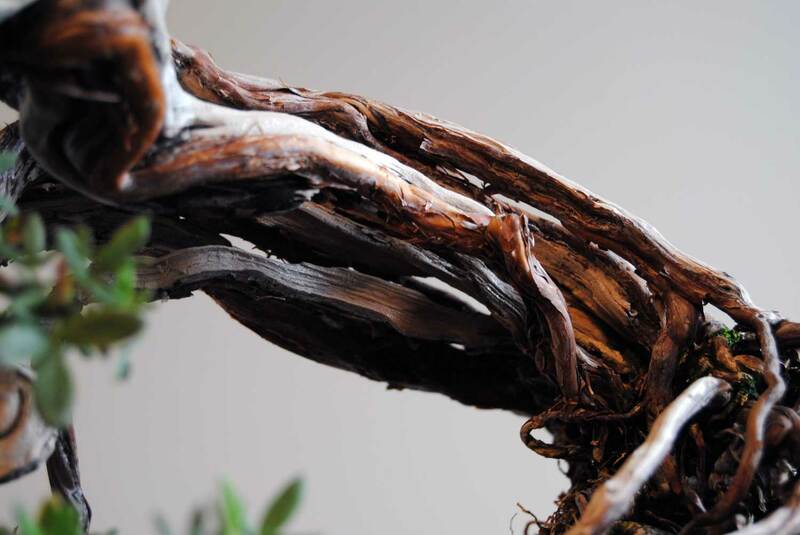 What does this mean for bonsai growers? 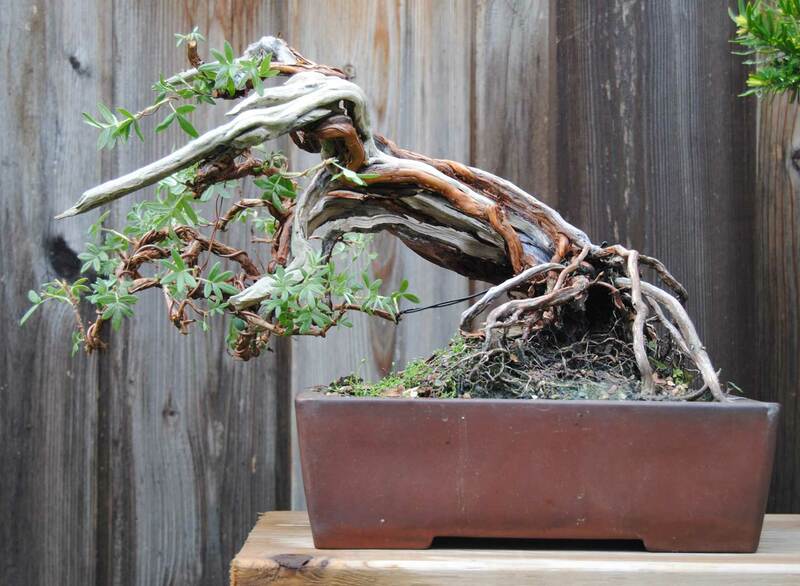 Borers are most likely to gain the upper hand on recently collected trees, or very mature and slow-growing bonsai. In other words, borers pick on the weak and the elderly, making them complete assholes. This source says that “the chewing of some [borer] species may be heard by someone standing near the tree”. Ok now that is just scary. Most often, a borer infestation is not identified until the damage is done. Just one enterprising borer could potentially girdle a trunk or a branch, causing the sudden death of a huge part of your tree. 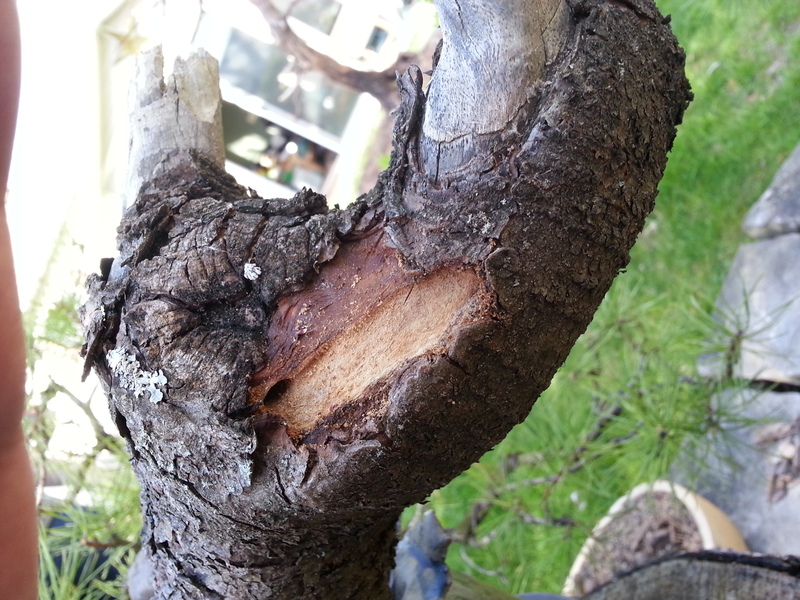 What Nick does not talk about in his book is perhaps the most alarming cases of borer damage – that on mature and established bonsai. 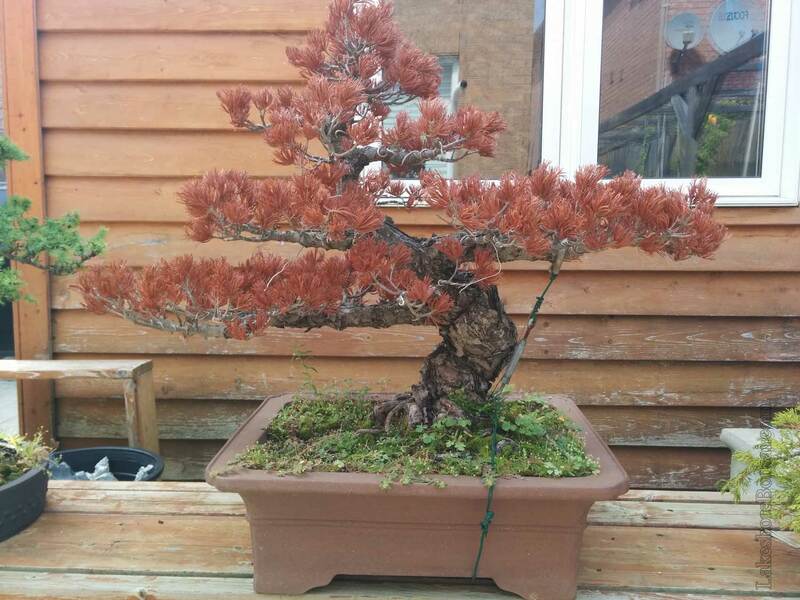 My friend and bonsai mentor has experienced this problem this spring in a big way. 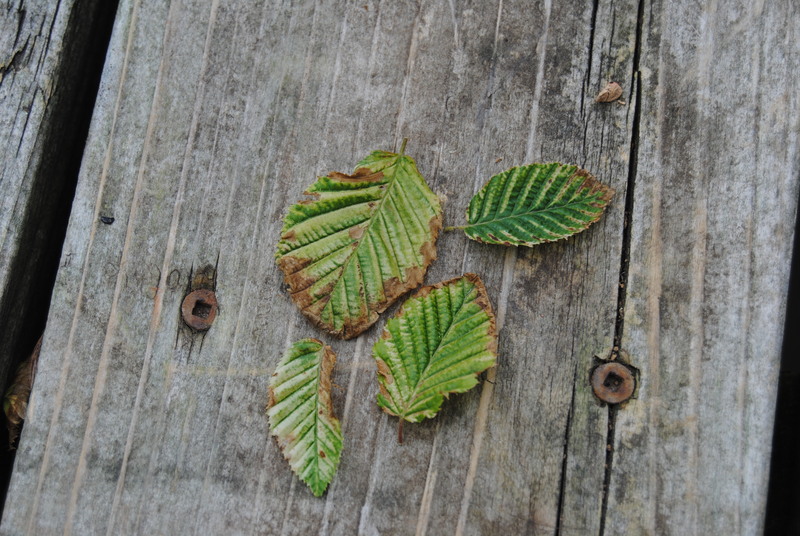 Here are some pictures of what you hope to never see on your larches. Large dead sections where the borer has been snacking. You can even see the borer’s tunnel. Sawdust is a characteristic sign of borers. 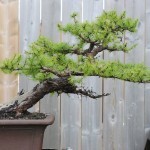 Another old, established larch with some cringe-inducing borer damage. It is difficult to see in this picture, although the borer trail extends well down the trunk leaving a trail of devastation in its wake. Fortunately these trees have not yet shown any signs of branch dieback due to the borer damage, although the scars alone are rage-inducing. He treated the infected trees according to Nick Lenz’s prescription outlined in his book. 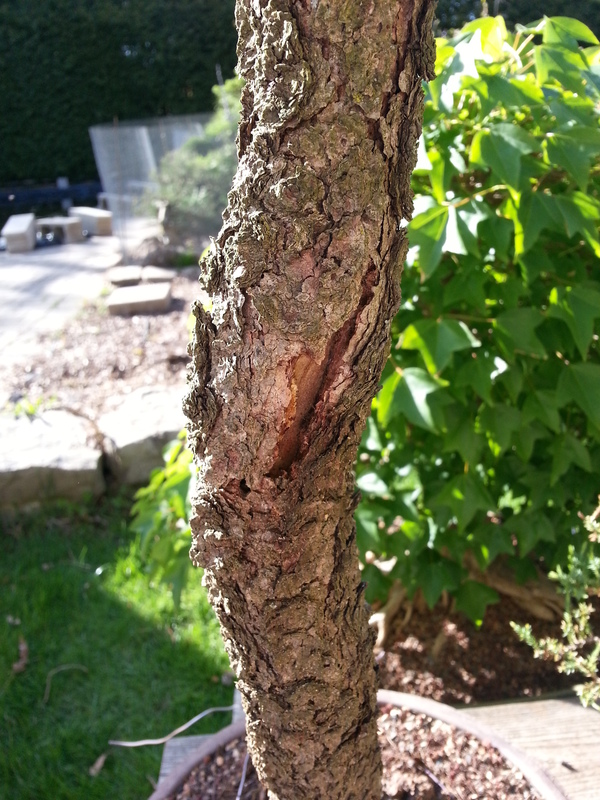 While I have not personally seen borer damage on my larches, my friend’s experience here has definitely raised my level of vigilance and hopefully yours as well. I’ve received quite a few emails from people asking about overwintering hardy trees outdoors. While there is lots of good information out there on the internet, most of it is region specific. What applies in England, Japan, or North Carolina does not apply in Toronto. With that in mind, this information is specific to zone 5-6 and is for people who have no special facilities (heated garage, polyhouses, etc.). 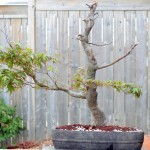 Reiner Goebel of rgbonsai.com has a good article about overwintering trees in the Toronto area. Have a read here. What I do is very similar. Use tough species to make life simple. Semi-hardy species (Trident maples etc.) require more attentive care in this climate. 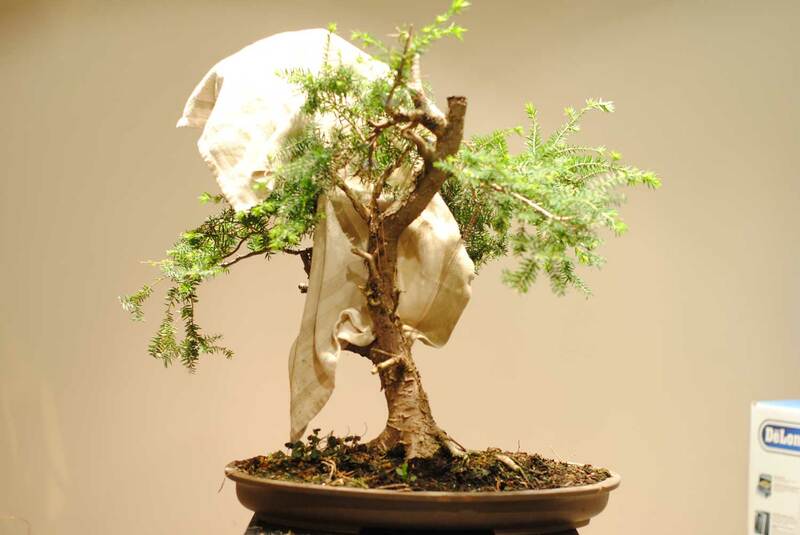 My collection consists of Eastern White Cedar, Larch, Juniper, Yew, Siberian Elm, Potentilla, Ginkgo, and few others. All fully hardy. Bury the pots in the ground in your garden and water everything really well. This insulates the roots. The risk is not the rootball freezing. It can and should freeze solid. The tree will be fine. The risk is frequent freeze-thaw cycles. 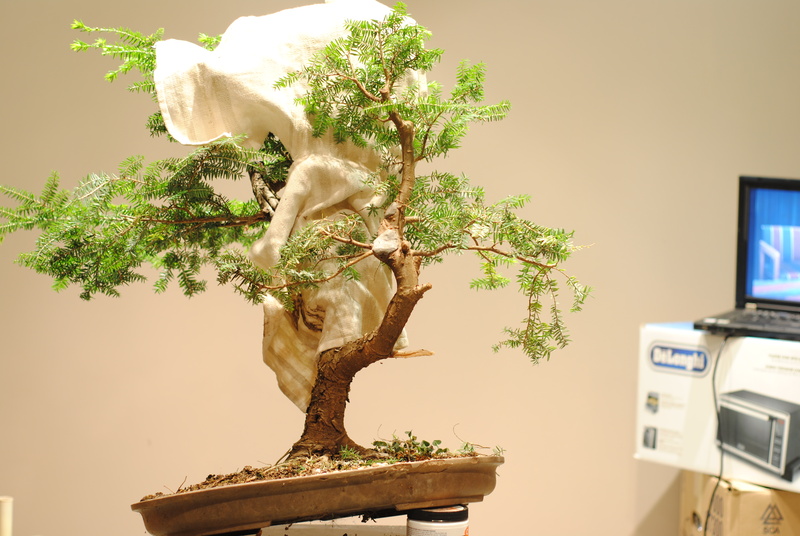 This is why unusually warm winters are more of a concern to us northern bonsai growers than unusually cold ones. Burying the pot helps ensure that once the rootball freezes, it will stay frozen until around March, even if there are some freakishly warm days in January (it happens). If your tree is in a massive training box but is a hardy species, just sit it on the ground and mulch around it. Just having contact with the ground will help buffer the rootball temperatures. Snow is your friend. As soon as fluffy snow hits the ground, shovel it onto your trees (don’t shovel on heavy wet snow!). Sure, three feet of snow can bend branches but I feel most comfortable when my trees are buried in snow all winter. This protects from -20 degree air temperatures and drying winds. But when the snow starts to melt, brush it away as this heavy slushy mess can really cause damage to branches and fine ramification. Try and winter them in a shady spot in the garden protected from the wind (i.e. a north facing corner). 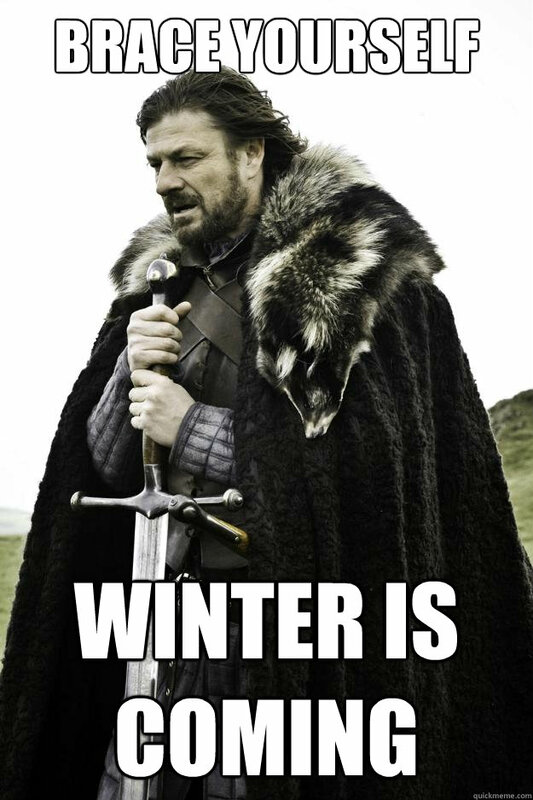 This provides a bit of insurance against wind and sun if it is a snow-less winter (like the infamous winter of 2011). It also helps keep the tree dormant as far into the spring as possible. This is important. If your trees break dormancy too early, the tender new growth will be exposed to the unpredictable early spring weather. Rabbit-proof your garden as best as possible. When rabbits get hungry in the winter, bonsai bark apparently looks quite appetizing. Even a couple of exploratory nibbles can ruin the image of a tree. Try to board up any gaps under the fence. If you have the energy, fence in your trees with hardware cloth to provide further protection from pests. Burying the fence a couple of inches provides me some reassurance against mice, although if mice want to get anywhere bad enough, they will find a way. Don’t worry about watering! If you put them away late enough, they should not need any water the entire winter. Again, keep them dormant as long as possible. Don’t take them out of the ground at the first sign of spring in March. You know that in our part of the world it is not impossible to have freezing nights in May, and these spring freezes can kill off tender new deciduous growth. This approach has worked well for me for 8 seasons. There are many ways to do it, but I find this to be the simplest and most foolproof approach. 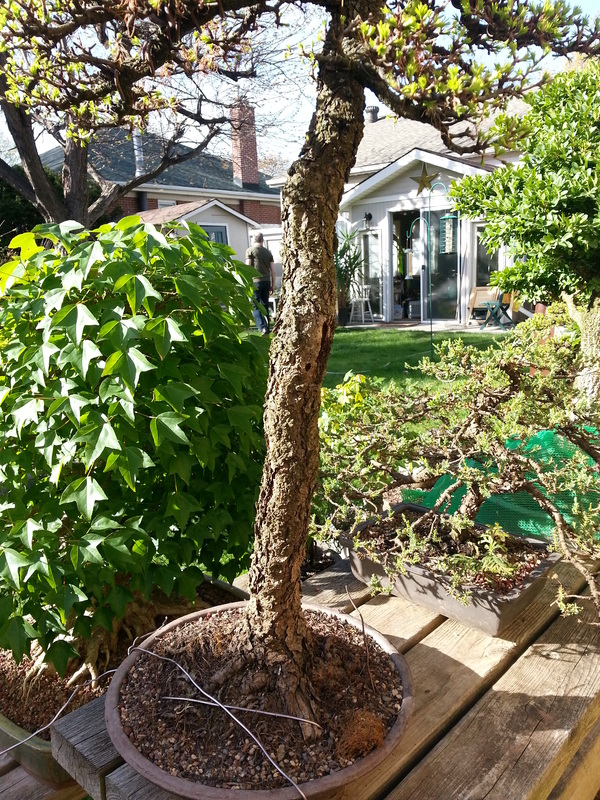 It takes some time to prep the trees for winter, but once they are in the ground you can literally forget about them, sit back, and wait for repotting season to come! Unfortunately, since the trees are frozen solid in the ground, you cannot really work on them in the heart of winter. Happy to report that I think I solved the health issues this tree was having over the last couple of years. Replacing the bonsai soil with mucky top soil seemed to bring it back to its former vigor. Now I’ve got a new problem – I’m not sure which of the two trunks to keep. You’d think I would have figured it out after 7 years of contemplating. Today before work. It is on its second round of growth which is much better performance than in recent years. For the last 6 years I have been planning to base the tree around this trunk. 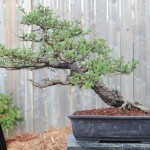 I even grafted a primary branch on with this front in mind (first branch on the right). The tree would be tall and upright with long downward drooping branches. Very simple but elegant, and easy to achieve with the somewhat difficult growth habit of T. canadensis. But then the apex died setting this tree back yet again. I’ve wired up a new apex but it needs about 2 years of strong growth before it is where I need it to be. To use the front above, I would have to remove this entire secondary trunk. Or, I could keep it and make this the tree. This is my dilemma. This trunk has much more movement and to many it would be the obvious choice. But something about it is awkward and unattractive to me. I don’t like the angle of emergence from the soil, and I hate the upper third. 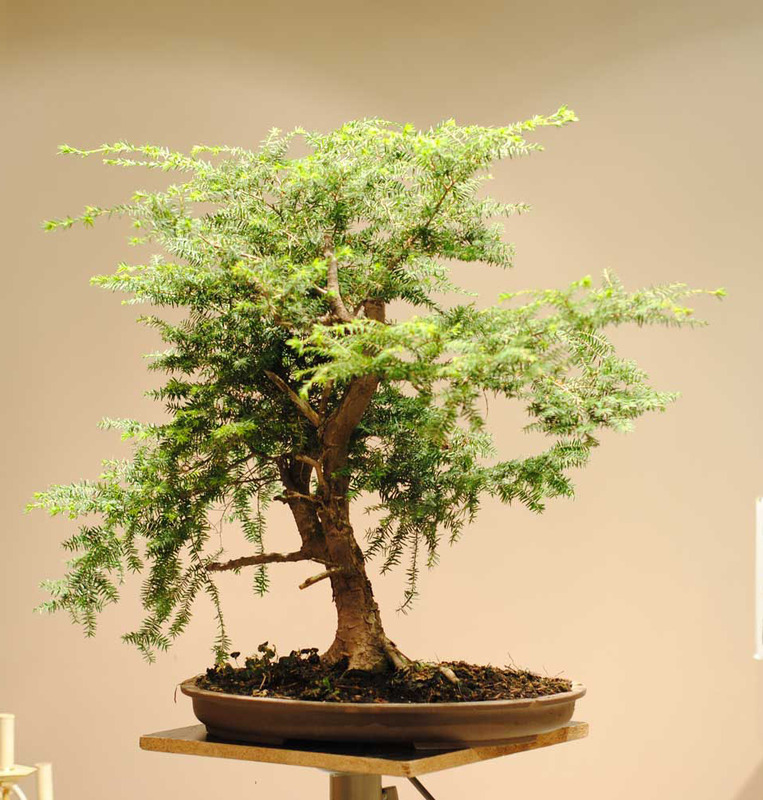 Plus I’m not sure if Eastern Hemlock would lend itself to such a dynamic design. 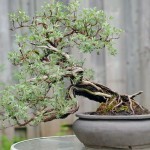 It is very difficult to get movement into the branches – they do not take well to sharp bending. The nebari is better from this side, however. Both options have their merits. I’m still undecided, so for now the tree will just grow. 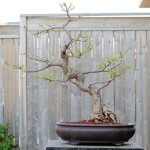 I featured this Ginkgo biloba ‘Mariken’ in a recent post where I began the air layering process on it. As expected, the unseasonably warm March we had has been countered by some freezing temperatures. Last week on a clear night it went down to -2 celsius. I brought most of my smaller trees in the garage, but this ginkgo was left outside to weather it. The damage is clear, but the tree is already starting to throw a new crop of spring growth. I am not concerned about losing the tree (I’ve seen ginkgo bounce back from worse frost damage than this) but am wondering what effect this may have on the layering process. Time will tell, I guess.